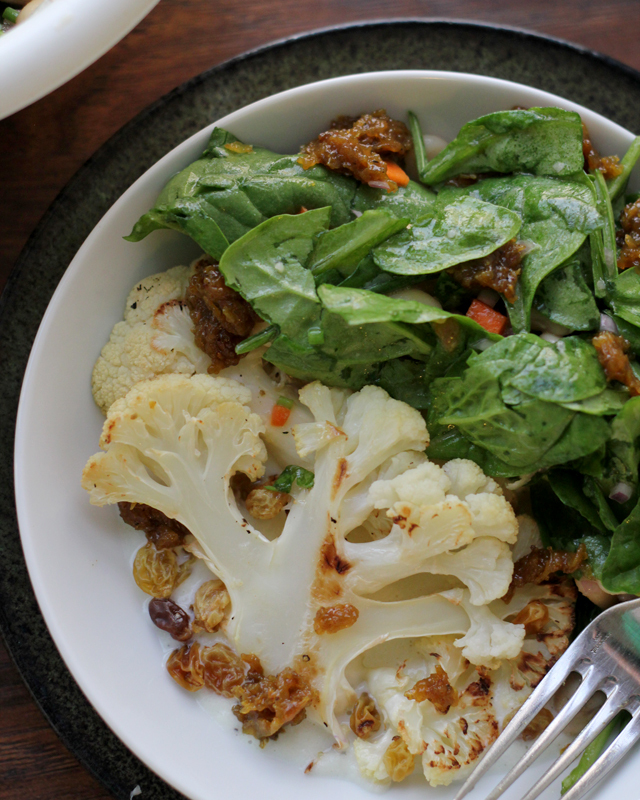 Caramelized roasted cauliflower is paired with a white bean salad and curried raisin jam in this farmer’s market inspired meal. The.Boy and I have a little inside joke when it comes to chain restaurants. Except….it’s more of an inside argument. Which is really more of an inside Cold War. Which is really mostly an inside screaming match. Insert random person in our lives who suggests we go to Applebee’s/Chilis/TGIF/Friendlys/The Olive Garden/Ruby Tuesdays. The.Boy considers it for a few minutes. While I start yelling like a maniac about the depravity that must exist in this world such that a warm-blooded, reasonably intelligent individual would actually desire to frequent such an “establishment”* and spend money on the poor excuse for food that they serve. And then I throw up in my mouth a little. It’s all quite civilized. Not. *I use that term loosely. In order to produce really good food, you have to have some kind of passion and respect for it. And somehow I don’t think the random guy on the line at Applebee’s whose job is to dunk the bag of frozen potato sticks in sizzling oil has that kind of verve. And then there are places where the enthusiasm for sourcing good quality ingredients and showing some appreciation for those who create and nurture them, is palpable. One such place here in NYC is Gotham Bar and Grill. They did this fabulous thing this summer to pay homage to the Union Square Greenmarket and all the farmers it houses, where they highlighted one farm each week, for twelve weeks, in an all-vegetarian lunch prix fixe menu. I only wish I had known about this earlier, because I would have been there. Every week. But there’s always next summer. And in the meantime, there is the recipe journal that they have produced, highlighting all the fabulous meals that they made this summer with gorgeous photos to accompany each recipe. Tantalizing creations, such as Basil Olive Oil Cake with Lemon Buttercream, Fried Green Tomatoes with Bourbon Roasted Peaches and Plymouth Cheddar Grits, and Corn Agnolotti with Fava Beans, Sungold Tomatoes, and Tarragon-Corn Broth, to name a few. I was lucky enough to receive two copies of this recipe journal – one for myself and one to GIVE AWAY to one of you guys! Love it. To enter the GIVEAWAY to receive a copy of this cookbook all you have to do is leave a comment telling me what your favorite farmer’s market find from this summer has been, and if you haven’t been to a farmer’s market – which piece of summer produce you’ll be the saddest to see go out of season. Winner will be announced next Wednesday! This recipe for roasted cauliflower with white beans and curried raisin jam is from the Gotham to Greenmarket Recipe Journal and all I can really say about it is wow. Wow because it got my boyfriend, who looked at it quite skeptically mind you, to eat and LIKE cauliflower. Wow because curried.raisin.jam.yes. Wow because all the components of this seem kind of weird together and yet they just work so that every bite is a mix of these crazy awesome flavors. Just. Wow. Forget Applebees. With this book in tow, we can just eat at my place. Kthanks. Caramelized roasted cauliflower is paired with a white bean salad and curried raisin jam in this farmer's market inspired meal. Preheat oven to 400. Trim the outer leaves off the cauliflower. Using a long bladed knife, slice the cauliflower into ¾-inch slices, reserving any small florets or trim that falls off. Lay slices on a baking sheet lined with parchment paper. Brush with olive oil and season with salt and pepper. Roast, turning once, until browned and softened, about 10 minutes/side. Meanwhile, place the small florets and trim that you set aside in a small saucepan. Add milk to cover them. Season with salt and pepper and bring to a simmer. Cook until soft. Puree in a blender. Season to taste. To make the curried golden raisin jam, melt the butter over medium heat in a saucepan. Add the onions and cook for about 5 minutes. Add the raisins and curry powder. Cook, stirring, for 2 minutes. Add the water and simmer for 10 minutes or until water has evaporated. Place in a blender or food processor and puree, adding water as necessary until it is smooth. For the white balsamic dressing, whisk together the balsamic, mustard, salt, pepper, and olive oil. 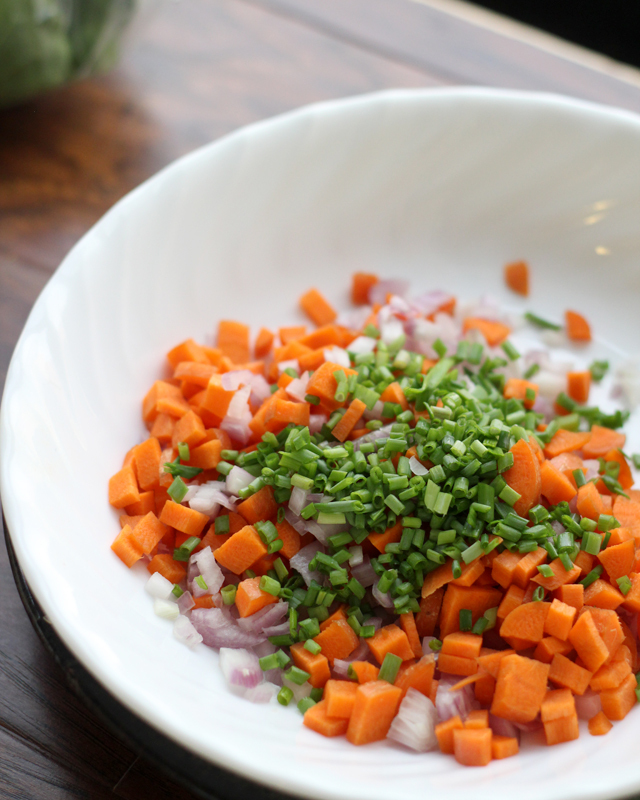 Toss the white balsamic dressing with the beans, carrots, shallots, chives, and spinach. Season to taste with salt and pepper. To serve, on each plate spread a spoonful of the cauliflower puree. Arrange the roasted cauliflower, white bean salad, and raisins on the plate. Drizzle with the curried raisin jam. What a great idea to have a week devoted to a specific farm! LOVE that kind of thing. We are fortunate enough in Boston to have sooo many restaurants that cook with local foods. And my fav find this summer at the farmer’s market? Organic strawberries that are just 100x better than those from the store! With recipes like this, there is definitely no reason at all to go out. I think you can probably win your argument just by dishing up 🙂 Also, what a great initiative with the Gotham Bar and Grill 12 week menu! I discovered kale this summer so the many varieties of kale tweaked my fancy. My farmer’s market has ground cherries! I’d never had them before, but figured I would take a chance. They are so fun to peel and eat! I love posts about unsung heroes and there seem to be a few in this piece. The cauliflower, the white beans, and perhaps most important, the good people at Gotham Bar and Grill. You, Joanne and all of these other components help raise awareness of good food, nutrition, and ultimately a sustainability free of the Applebee’s/Chilis/TGIF/Friendlys/The Olive Garden/Ruby Tuesdays in our lives. Awesome work, and thank you for sharing!! I love, LOVE roasted cauliflower. Is that weird? I need to branch out and try this version! Amen to your thoughts on chain restaurant food. I feel the same way about chain food! I don’t understand it–if you are going to indulge, EAT GOOD FOOD NOT CRAP THAT DOESN’T TASTE GOOD! Cauliflower is one of my FAVORITE vegetables and almost work the ending of summer to enjoy it more often and in season. Great combination of ingredients, well balanced between sweet and sour,crunchy and creamy. My favorite summer produce find is definitely yellow beans and homegrown strawberries! I could seriously eat them both all day everyday! I refuse to eat at chain restaurants. I make exceptions for Wagamamas and….I think that’s it! I much prefer to shop at farmers’ markets too when possible although it does take some organization. My favourite farmers market discovery this summer was greengages! I’d never had them before but they were so tasty. This roasted cauli dish looks right up my street. Something about cauliflower makes it work so well with sweet elements. 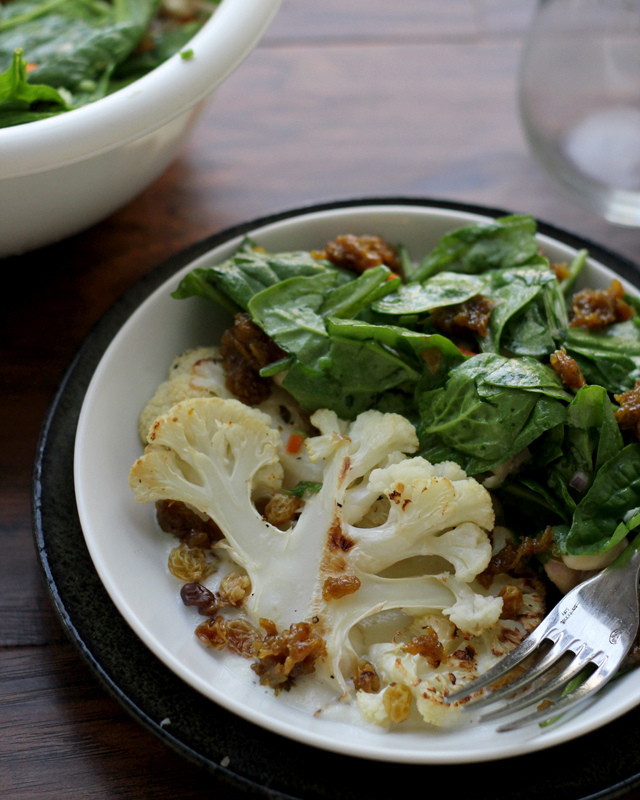 Roasted caramelized cauliflower sounds so good! I found some really interesting eggplant this year… different shapes and sizes from the usual. Love shopping at the farmers’ market! I truly think you and I could be real life friends. I live near Annapolis and there are so, so many great restaurants. Places that utilize all the area has to offer from freshly-caught seafood to local produce. Even locally-produced wines. And my husband likes Red Robin. I differ in that I don’t mind grabbing something fast once in a while but really, I’d love to try out the amazing, locally-sourced grilled cheese sandwiches Armadillos has to offer or the freshly-caught seafood from Red Red Wine Bar. Alas, I instead make meals at home. Meals like this one because man, does it look delish. Hey girl – I ‘ve been to the Gotham Bar and Grill over on East 12th street. Food is really good therer! Your roasted cauliflower looks amazing! Well, I have to say that this year the one thing I found new ( first time ever) to me at the Farmers market was the Kale. I never had it before until this summer and really got to understand why everyone is so nuts about it – so that was a great find for me. The veggies I will miss are the tomatoes, and the zucchini. BUT the one most of all – hands down ( is in the fruit category) – are the AMAZING Peaches – they are unbelievable here in the South. We love shopping at the farmers’ market! I am the same way when it comes to this big chains although I go there every now and then 🙁 Dallas Farmers Market is huge and this summer I really enjoyed something different here – pattypan squash! I really really want to win this journal! 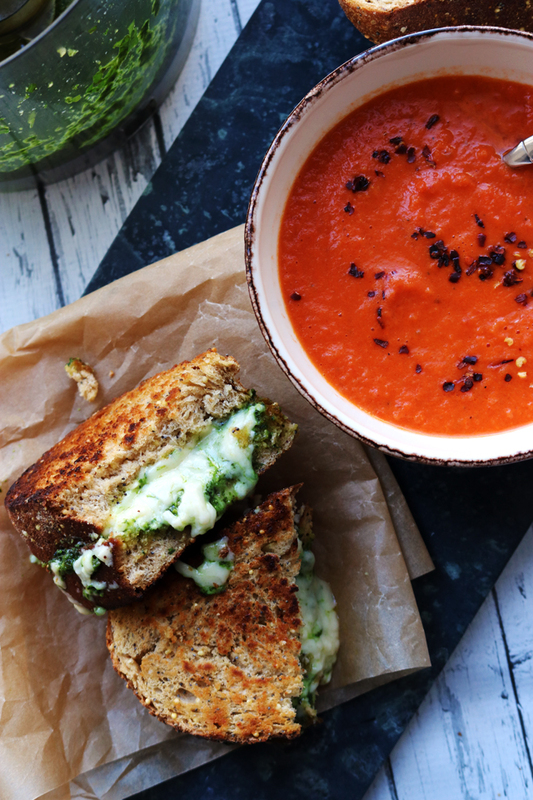 I have always loved this combination of flavours, this looks amazing! My husband loves crap food. He even admits that he distinguishes very little between fine food and items masquerading as food. Frustrating when he seems to get just as excited over a Subway sandwich as a home cooked meal. I am so intrigued by that raisin jam – I bet its fantastic! I wish I lived in NY so I could eat at places like that!! We have one local restaurant that actually sources the food from farms, etc. in the area and it tastes so much better!! 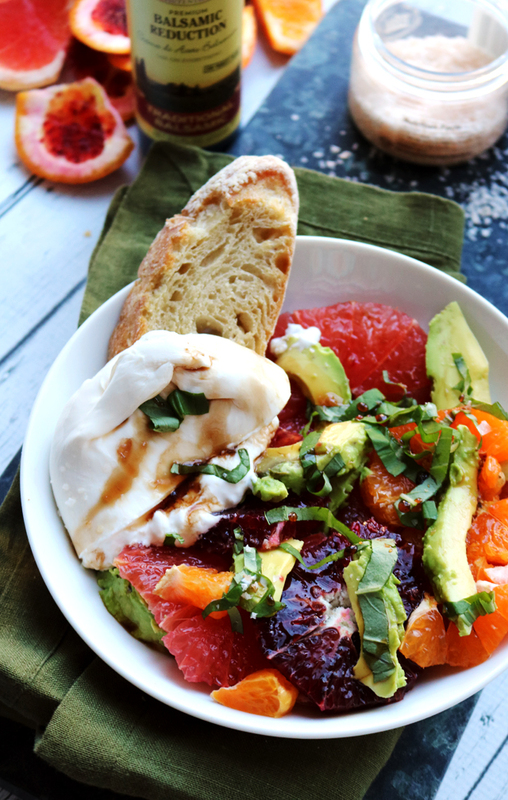 And I love the sweet, tangy, smokey thing going on in this dish! I’m a little embarrassed to admit it, but eggplant has been by “new find” this summer. We get much of our fresh produce from a CSA and I wasn’t sure what to do with the eggplant so started searching for recipes. 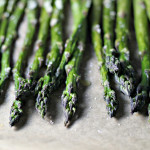 I’ve tried several this summer, some good, some only ok – but it will definitely continue to be a part of our meal plans! Oops – one more comment…I am totally there with you on the chain restaurants thing. Especially when we are on vacation, we make it a rule that we don’t eat in any chains. This has served us very well – many of our vacations are defined by some food or restaurant we found! I want to put that curried raisin jam all over everything! This would be a perfect side dish to any meal 🙂 I’d say my favorite farmers’ market find this summer was this incredible garlic – so much more flavor than the white California variety. heirloom tomatoes. I saw them at our favorite farmer’s stand upstate: Barthel’s Farm in Ellenville. They are so beautiful! What a gorgeous dish! My favorite farmer’s market find this summer was golden beets. I used to think I didn’t like beets – was I ever wrong! WOW! This is a fantastic vegetarian recipe any foodie can get behind….seriously curried raisins is brilliant! YUM! I think look delicious! I love cauliflowers!! Honestly, I can’t imagine living in a city like NEW YORK and eating at a chain restaurant. Stand your ground sister! Everything on this plate looks delicious and comforting. Cauliflower is a very spurned vegetable because of its distinctive smell when it is cooked, but I love it and your dish looks perfect. I must admit that I sometimes crave chains food and I do from time to time indulge in such a meal. What I will miss the most from summer is watermelon! I can never wait for your posts, oh gosh, you’re hilarious! 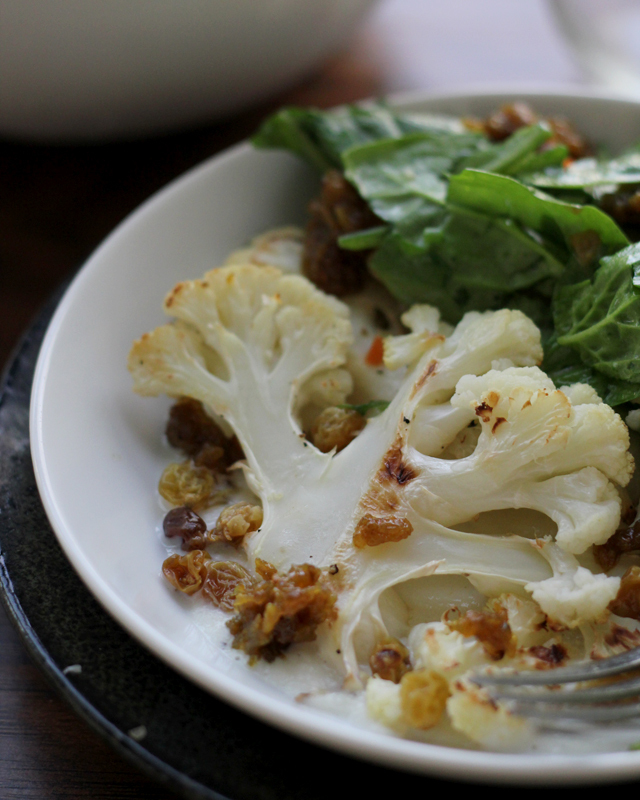 And this dish looks stunning, raisins + cauliflower sounds like a flawless combo! Is the giveaway open to non US residents? Because I’d love a copy of the book, it sounds so so nice! uhh, this recipe sounds INSANELY DELICIOUS. my favorite farmer’s market find this summer has been German butter ball potatoes, which I’d never tried before. they’re delicious and creamy when roasted! I’m the most sad about zucchini and summer squash departing, although Im a little tired of it, I know as soon as its gone I will cry over it. 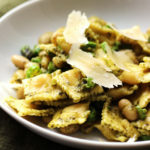 What a delicious seasonal recipe with fresh flavors. Since I adore eating cauliflower, I know I will make this over the weekend. Roasted cauliflower is truly the greatest. 🙂 I can’t say I’ve ever thought to do much of anything with raisins besides just eat them in trail mix form, but this dressing sounds intriguing–sweet & sour & clearly packing a ton of flavor! My favorite farmer’s market find is, uh, most things? How about the new summer corn? That’s always pretty amazing. 🙂 Thanks for the giveaway opportunity! My favorite farmer’s market find was a sungold cherry tomato plant that has improbably survived the hot Texas summer and continues to give me delicious tomatoes. You are speaking my language, Joanne! I just roasted a bunch of cauliflower this week and i LOVE adding sweetness to it. You’ll have to try the cauliflower side at West Bridge in Cambridge, if you’re ever back in Boston (I think it’s slightly different by season, but recently it included golden raisins)! You just proved that simplicity can go a lot way. Love cauliflowers and I have a couple always sitting in my fridge, hey why not make it for lunch now, thanks for the idea, J.
Curried raisin jam *facepalm* it’s the obscure nibbles I had dining at a new Indian spot the other night and now I’m wondering when I can make this recipe because I need it back in my life! I’m not a terrible chain snob, but we don’t frequent any of those places. I mean, why go to The Olive Garden when you can go to the Old Spaghetti Factory! I like my pasta drowned in brown butter and mizithra cheese. I’m totally in your camp when it comes to chain restaurants! No way, no how, you could not pay me to eat there. Maybe it’s just me, but the Greenmarket this summer seemed especially wonderful. My best find all summer were heirloom tomatoes for sure. I also do everything in my power to not eat at chain restaurants. I find that the food all tastes the same and has a artificial rich taste. I understand some people live in really small towns where Olive Garden is the biggest deal, but here in SF (and in your case, NYC) there is so many local restaurants to choose from and sometimes they are even cheaper! Roasted cauliflower is hands down one of my favorite side dishes or snacks. Can’t wait for our next cauliflower harvest in a few weeks to get snacking on this again! i didn’t know that Gotham Bar and Grill did that, but what a great idea! Everything on that menu sounds a.m.a.z.i.n.g. I NEED a copy of this recipe journal!!! 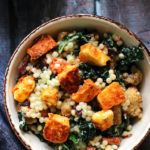 Nate hates cauliflower, so i wonder if I could convert him with this recipe…but first I’d have to convince him to take a bite. Hmm, I think I’ll be saddest to see those deliciously juicy peaches disappear…. That’s hilarious! You and are are on the same page when it comes to resteraunts. My husband knows better than to even suggest we go to a chain resteraunt anymore. The farmers markets are just getting started back up here in the southwest (too hot to grow anything!) I will sorely miss fresh berries!!!!! My favorite farmers market find this summer would have to be a huge sweet potato plant. So beautiful. I can’t stand chain restaurants and avoid them. Just absolute junk food in them. I love going out to eat though and usually go to a family owned restaurant. Have to say I do miss good NY diner food!!!! AMEN! I can’t even imagine straight up wanting to go to Arby’s..EW! Plus, making food at home is so much better. The jam you made looks unbelievable! LOVE! I end friendships with people who suggest eating at such establishments. It’s true. At first, my husband thought I was crazy, but after being married to me & getting used to great food, he agrees now. “Those people just aren’t our kind of people,” is what we say. My favorite farmer’s market find this year has been this stall that has oodles of fresh radishes and kale week after week! PS How do you feel about Panera? I love this easy and delicious side, Joanne! That jam on the cauliflower sounds killer! 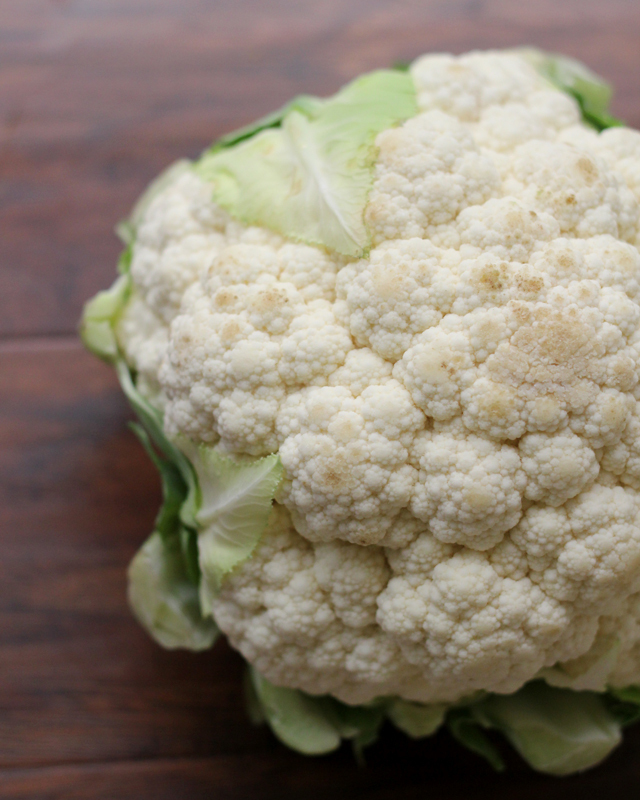 I’ve been trying to like cauliflower more so maybe this is THE recipe to start with! I love the selection of peppers. I guess my favorite find were the eggs that I started buying at the local Farmer’s Market. It’s nice having been to the farm that I buy my eggs from. I’m going to miss the tomatoes most – it’s impossible to go back to those grocery-store tomatoes, which are so bland and gross. My favorite find this summer was fresh figs. My favorite Farmer’s Market find is fresh basil. Lovely recipe. I love roasted cauliflower. I am going to miss the peaches, they were simply delicious this summer. As for the farmer’s market, I really got hooked this year. One particular organic farm there has great produce and I have not been able to pass up their greens and arugula each time I go. So much flavor! my favorite farmer’s market find is one I can’t remember the name of – it is a plum which has freestone pit. maybe Italian?? so good in taste and I love that the pit pops out just like in a peach. Love roasted veggies! 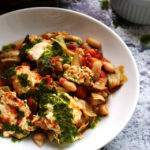 Your white bean salad looks so delicious and moreish, Joanne. Curried raisin jam??? Instantaneous love. I completely agree about those “establishments,” which is why the blogosphere can be another wonderful way to combat that encroaching food culture (or lack thereof). CHEERS TO BLOGGERS LIKE YOU! What a beautiful dish, Joanne. These caramelized roasted cauliflowers, white bean salad and curried raisin jam = amazing savory tastes. The eatery Gotham Bar & Grill sounds interesting, I like the idea of having all-vegetarian lunch prix fixe menu… thanks for the recommendation! I haven’t been to NYC for years…I think I will have to pay a visit! And what a fabuous giveaway… my favorite Farmer’s Market is Portland Farmers Market in Portland, Oregon. They aren’t new finds, but my favorites are always the fresh kale and peppers. Just can’t get anything quite as good at the grocery. This looks amazing. I wish I had known about Gotham B&G when i was there on vacation. Oh well, add to the list for next visit! 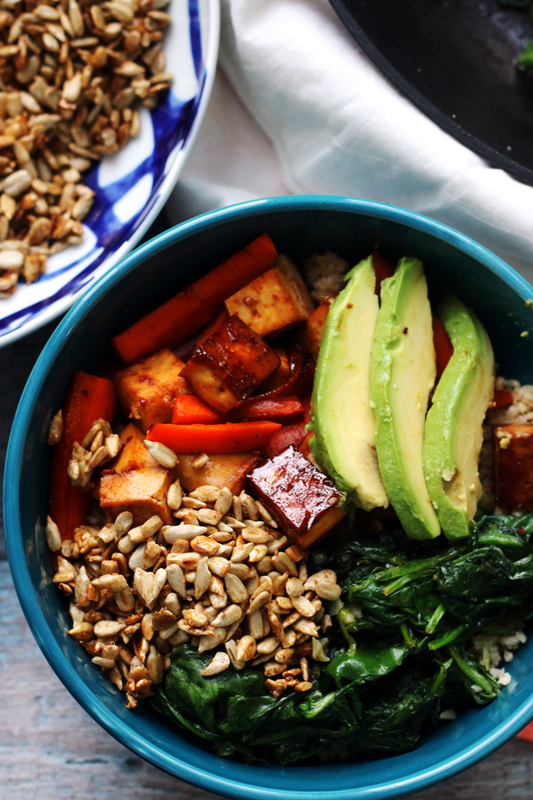 I would be so happy to be a vegetarian and live on food like this – perfection! I love the International Farmers Market near my house in Atlanta. My sister spotted it on the food network and wanted to visit. I need to go and get some pears there for a salad. Cauliflower looks good. Those chain restaurants are really vegetarian friendly, for sure. Oh, my, I want this dish and this cookbook! My favorite farmers’ market find is always heirloom tomatoes. I literally cannot eat enough of them. On the restaurant front, I am the same way. In my youth Chili’s and Max and Erma’s were my faves, but now, if I’m going to eat out, it’s going to be a good restaurant with real food. I’m even about done with Morton’s, as they serve frozen fries. Seriously? This big, fancy, and expensive steakhouse can’t cut their own fries? This is a healthy and flavourful dish, loving the cauliflower recipes lately, my new fave veggie of the month! I love how your inside joke turned into a full out war in only a few sentences. How true is that? Be careful what you offer – eat at your place? I don’t know anyone who’d pass that up. You’re going to have an army at your door. that sounds like an awesome event!! and what a delicious meal, i’m totally in envy of that lunch right now 🙂 with a slice of basil olive oil cake, please! Haha. I SO agree. Ryan’s family goes to Applebee’s a lot. Needless to say, we have never, and I mean never, gone with them. I just can’t do it! This cauliflower however? Absolutely. Thank you for sharing it! I have this journal…and need to get my but in gear looking through it! This cauliflower sounds amazing…raisins! The last time I went to Olive Garden, my friend found a piece(s) of hair in her food. Enough said. Love your recipes – you have been a consistent inspiration this year. those recipes sound AMAZING! I adore roasted cauliflower – I can imagine how absolutely delicious it is with that curried raisin jam! 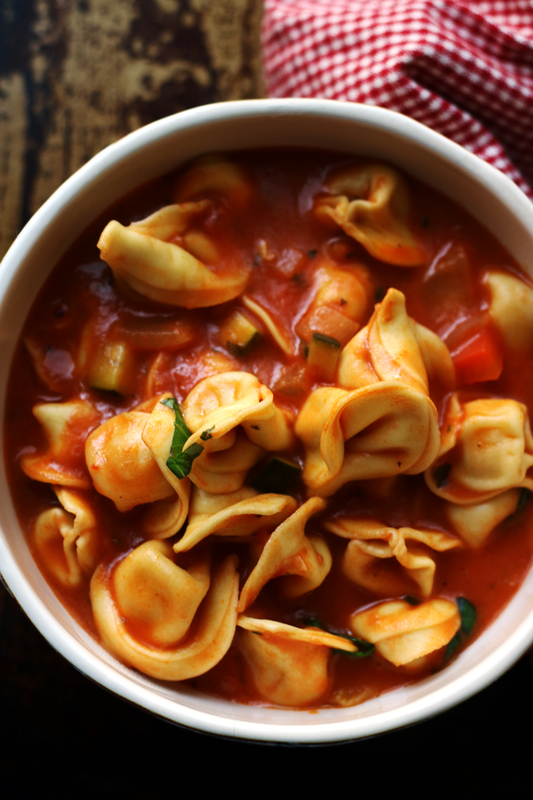 Cannot wait to make this with the cauliflower arriving yesterday in our CSA. Having recently moved from Idaho to San Fancisco, the farmers market here was a dream come true. For example, obviously I knew dates were fresh at some point in their lives, but had never actually thought about it and definitely never seen them prior to moving to CA. Favorite summer find though is peppers, there are so many awesome options from sweet to spicy… Grilled padron peppers? Yes please. Ooh I love your new site design! Pretty. Add me to the list of people who love cauliflower. This dish looks so good! yummy zucchini is my favorite! My favorite farm market starting selling the most wonderful home-grown broccoli this year. Every week I’ve been buying it by the armfuls. This summer I go some incredibly juicy peaches and I’m sorry to see summer end. It’s definitely my favorite time of the year! I have been eating roasted cauliflower all week but it doesn’t compare to this! I love the sound of the raisin jam! So unique and something I definitely need to try. I’m going to miss zucchini the most! Hi, Was just in the Union Square Market on Monday and will be there later on today for lunch at Union Square Cafe. Went to Gotham Bar and Grill a few years back and we loved it. I think it’s time for another visit. My market finds were some gorgeous pink and orange heirloom tomatoes and the best nectarines I’ve ever tasted. I love the Market and try to get there at least every other week. 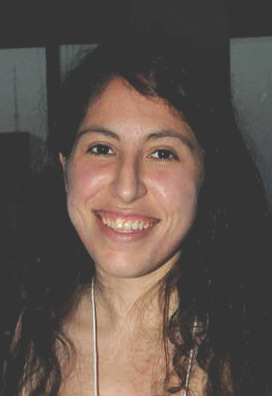 Source: Son worked for Quaker Steak and Lube. Vast majority comes frozen, sauces premade in bags, etc. I got the BEST watermelon. So sad to see corn on the cob go. This past summer I have been loving chard – and related recipes from Jerusalem. and pine nuts. wonderful. now excited to have just joined my first CSA, which starts in a couple of weeks (I live in Florida). We get great stuff all year, so fortunate. my favourite summer treat are local peaches! Oh my gosh. We are so alike in this regard. I pretty much refuse to eat out if I have to eat at one of those places. Some people say I’m a food snob. I say “why the heck would I pay to eat at a place like that when I can cook something better at home?” Boom. I assume I am too late for the journal, which is a bummer and my own fault for being so far behind but OMG does this look yummy. Pinning now! 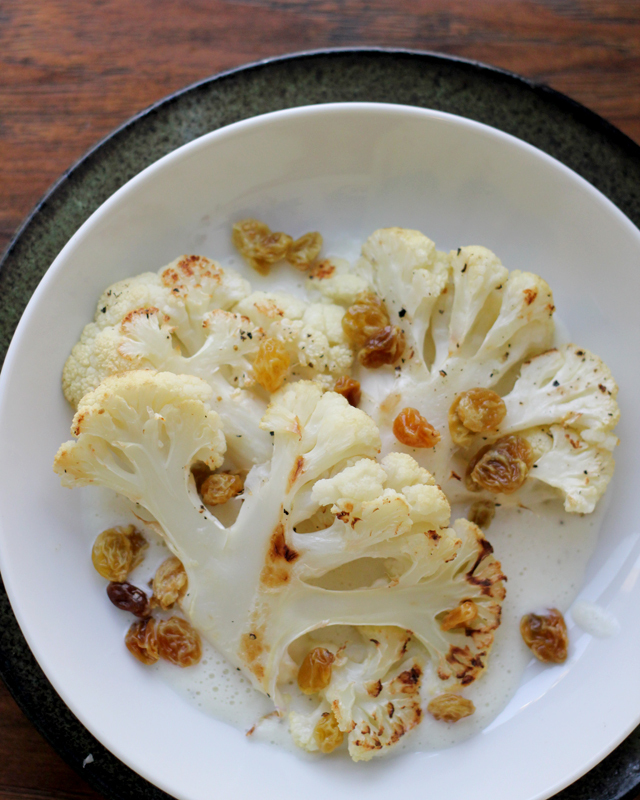 I love sweet flavors with roasted cauliflower!